The 1.6 ton, larger-than-life dinosaur enters stage left, and roars with such realism that the little children squeal, and clutch their parents. There are comebacks, and then there are comebacks! After a mere 65 million years, T-Rex is back to take a bite out of show business. And this massive beast isn’t alone. The bad mama is accompanied by 14 other dinosaurs, all of which are ready to hear the screams of excitement of throngs of people. Already seen by more than a million people, Walking with Dinosaurs: The Live Experience is coming to the Xcel Center in St. Paul, June 11-15. Six years in creation, this $20 million show wows every dino-enthusiast out there. With roars and shaking seats, it requires 150 men and women to operate everything from the lights to the movements of the dinosaurs’ eyes. Gavin Sainsbury is among the very important people who help stage this massive show. He’s one of the puppeteers who control the dinosaurs as they walk, stomp, and strut their way around the arena. Today, Sainsbury has upgraded just slightly to some of the most high-tech puppets out there. Yes, even though they weigh more than a car, are powered by 12 truck batteries, and have nearly 3,300 feet of cables in each body, they are still just puppets. For a man who recently worked with the Jim Henson Company, operating a dinosaur is a bit different. Sainsbury knows this remotely controlled beast isn’t a hand sock. Sainsbury is just one of three people who control each of the 10 large dinosaurs that grace the stage. The other two help operate the head, tail, mouth, and roars of each dinosaur. It’s a well-choreographed dance. T-Rex may be the star, but who can blame a man for trying? 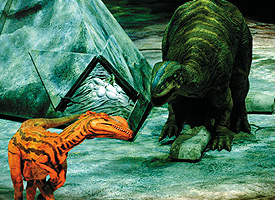 With a running time of 90 minutes, the show spans the entire 200 million-year reign of the dinosaurs. The highlight of the show may be the T-Rex, and the team built two. But the star isn’t the biggest attraction—as if 1.6 tons isn’t big enough. Actually, the Brachiosaurus clocks in at a massive 36 feet tall, and spans another 56 feet from nose to tail. The show starts with the splitting of the Earth’s continents; moves on to the transitions of the climate to lush green prairies; and finishes with erupting volcanoes, forests catching fire, and the final act of destruction—the comet that ended the reign of these awe-inspiring creatures that ruled by brute size. Its success already has garnered a European and Asian leg of the show in 2009. The dinosaurs ruled the entire planet once. Now, it’s time for them once again to show the world why.